The Internet’s given us a great many things, including a boatload of Flash games with which to waste our time. 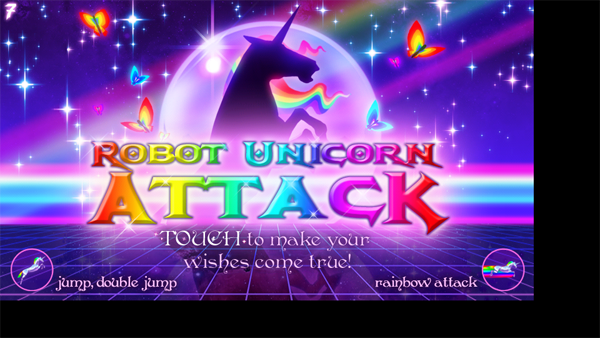 Last year, when there seemed to be a bit of a lull with them in favour of Facebook games like Farmville, one glorious product emerged: Robot Unicorn Attack. This game took the Internet by storm, and introduced a whole new generation of gamers to the wonders of 80’s synthpop and its infinite trippiness. What started off as a Flash game on Adult Swim’s site migrated to the infinitely more profitable markets of Facebook, iOS and now Android. Robot Unicorn Attack comes in at a cool 99 cents (I’m assuming, as it shows as $0.94 due to Canadian price adjustment) and, from what I can tell, it worth just about that. Just-less-than-a-buck seems to be the magic price for a lot of apps, as its not so much that it provokes a huge decision, but not so little to not make any cash. The game is essentially simple; it’s got a button to jump and a button to dash. Your job is to get as many points as possible in three lives. Throughout the entirety of the app, you’re treated to “Always” by Erasure: YouTube it. You won’t be disappointed. With such a simple premise it’s hard to review; I mean, the app does its job and replicated the experience on the Android platform well. However, the only complaint is that until the game starts up, I get the black bars (pictured above) on my Atrix; I’m not sure if this is a resolution problem or if it shows up on other phones. You guys will have to help me out in the comments. The game offers two control schemes: one with on-screen buttons and one based on gestures. The gesture controls, while a bit interesting, don’t necessarily allow for accurate play at the game gets faster and faster. I’d recommend sticking to the button controls unless you want a challenge after the ticker rolls past 10,000 points. Feint integration, which I’m usually not a fan of, adds some much-needed replayability to a game with such a simplistic concept. I don’t have many friends on it (feel free to add MattDemers), but score competition could definitely keep this game from getting stale. You can download Robot Unicorn Attack from the Android Marketplace. Matt Demers is Droid Life’s app guy, and will be stepping up the review production now that school’s over. Follow him on Twitter for more updates! DROID Incredible 2 and Casio G'Zone Demo Units Arrive in Stores, First Shots of Retail Packaging?